LIBOR Manipulation is NOT news as my article of 28th June illustrated that the mainstream press is only now coming to terms with the fact that the LIBOR rate is manipulated, something that most market participants have know for years and so will have the Bank of England and FSA, though they appear to be pretending otherwise, and something that I was aware of BEFORE Lehman's went bust in September 2008. Neither do the Bank of England and the Treasury recognise that the official BBA LIBOR rate is broken , i.e. that the reported rate is not reflective of the true level of crisis as the reporting Banks are reluctant to announce the degree to which the banks are unable to function due to the continuing deleveraging of the huge $500 trillion derivatives market. “What I hope is that everyone now understands that something went very wrong with the UK banking industry and we now need to put it right,” he said. “From excessive levels of compensation, to shoddy treatment of customers, to deceitful manipulation of one of the most important interest rates. The truth is : The biggest manipulator and smoke and mirrors deceiver of them all is the Bank of England, it has printed £325 billion (QE) to date for the purpose of manipulating market interest rates lower across the yield curve, all the way from short LIBOR right through to the long dated Government Bonds. This is a FACT, the Bank of England has manipulated the market interest rates lower between banks and for government bonds, the consequences of which is has been high inflation as I have cataloged over the years. 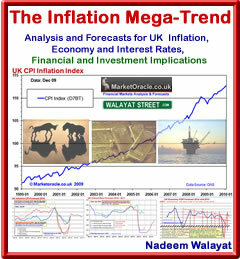 The Bank of England Forecasts are NOT actually forecasts but propaganda aimed at soothing public concerns on the inflation and economic growth fronts by talking the economy in favour of where it wants the economy to be so as to enable the BOE to improve the probability of achieving its set economic targets and goals which would be far more difficult to achieve i.e. to target 2% inflation if it had to be more candid. Additionally admitting to the more probable implies that they are NOT able to do their jobs as it is far better for the Bank of England to be seen to be in error in its forecasting then to have seen high inflation coming but failed to have acted to prevent it. The Bank of England has continued to pursue an artificial banking system by keeping interest rates at an extreme historic low of just 0.5% into the end of 2009 so as to flood the bankrupt banks with liquidity to enable them to rebuild their balance sheets by overcharging customers against the base interest rate and manipulated interbank market rate of 0.66% against rising real market interest rates which have been in a steady climb since March 2009 which increasingly means that the base interest rate has become irrelevant to the retail market place as explained in the article - Bailed Out Banks Not Lending, Sitting on Tax Payers Cash. One of the primary objectives of Bank of England's is to continue to funnel tax payers cash onto the balance sheet of the bankrupt banking sector for which low interest rates is one of the primary mechanism as the Bank of England remains petrified of the potential for the Banking Sector to trigger Financial Armageddon. The Financial Services Authority (FSA) has today fined Barclays Bank Plc (Barclays) £59.5 million for misconduct relating to the London Interbank Offered Rate (LIBOR) and the Euro Interbank Offered Rate (EURIBOR). This is the largest fine ever imposed by the FSA. The truth is : The FSA was found to be sleeping at the wheel again as took the U.S. CFTC to act on Barclays blatant LIBOR manipulation which forced the FSA to act. Those that make all of the decision at the FSA are ex-bankers who knew precisely what was going on but did nothing as many expect to return to banking after they have done their tour of duty at the regulator after insuring that the banking industries interests have been protected through light touch regulation. The near collapse of the banking sector over the past 3 years illustrates the failure of the financial services authority to regulate. Yes the failure is over 3 years and not since the collapse of Northern Rock some 2 years ago, for the FSA first warned the British banks in 2006 following the peak in the US housing market to STRESS TEST their business models in the event of a 40% crash in house prices, coupled with mortgage defaults of 35% and to reign in excessive risky mortgage lending at too high salary multiples. However as we have seen, a decline in house prices of less than 15% by September 08 had brought virtually all of the British banks to the brink of bankruptcy only prevented by a tax payer bailout now totaling £1.5 trillion of liabilities to date which are expected to grow to £2 trillion ! Unfortunately the FSA talked the talk but DID NOTHING TO PREVENT OR REGULATE THE BANKS and therefore ensured the BOOM during the first 6 months of 2007 followed by the BUST that immediately wiped out Northern Rock in September 2007 and proceeded to wipe out bank after banks capital bases towards zero right upto September and October 08's Financial Armageddon panic that resulted in the across banking sector bailout and panic interest cuts by the Bank of England on the direct orders of the Prime Minster Gordon Brown, who announced the first 0.5% cut himself at Prime Ministers despatch box which sent the signal to the markets of exactly who now is in charge of setting UK interest rates, certainly not the Bank of England who's MPC had been sat twiddling their thumbs for the preceding 12 months of the crisis. Fast forward to the present and we have recently had the FSA make announcements of regulating house prices lower by means of capping multiples. However the past 3 years have clearly illustrated that the FSA is a fundamentally flawed institutions that is incapable of regulating the UK banking system. Politicians of all parties from the Prime Minister downwards have been lining up to bash the bankers and stating that this time it is different and action will be taken. The truth is : Politicians rely on the Bank of England to print debt / money to finance the huge budget deficit so as the party in power can buy votes, to achieve this the Bank of England encourages the banks with cheap money and capital requirements to buy government debt with the FSA playing its role by employing ex-bankers that employ light touch regulation. The CPI and RPI Index graphs clearly show there IS NO DEFLATION! As Deflation in our money printing fiat currency bankster run fraudulent financial system can only exist fleetingly as a mere ripple on the surface that is utilised by the vested interests in the Inflation Mega-trend to ensure further inflationary money printing policies are always enacted by governments so as to STEALTHLY Steal the wealth and earnings purchasing power of ordinary people who are gradually FORCED into becoming debt slaves in an attempt to maintain falling standards of living. And there dear reader lies the fundamental truth that bankster crimes are as a consequence of our fiat currency fractional reserve money printing inflation inducing votes buying financial system, if the system remains as is then so will bankster crimes continue for their exists a revolving door between all parties that rely on one another to achieve their objectives, for politicians it is to buy votes and stay in power for bankster's it is ultimately to turn everyone and everything into debt slaves. It remains to be seen how long it takes for these facts to emerge in the mainstream press in that all parties are just as culpable as Barclays senior staff, because they are all part of the same system. FIGHT THE POWER, DON'T BORROW MONEY!